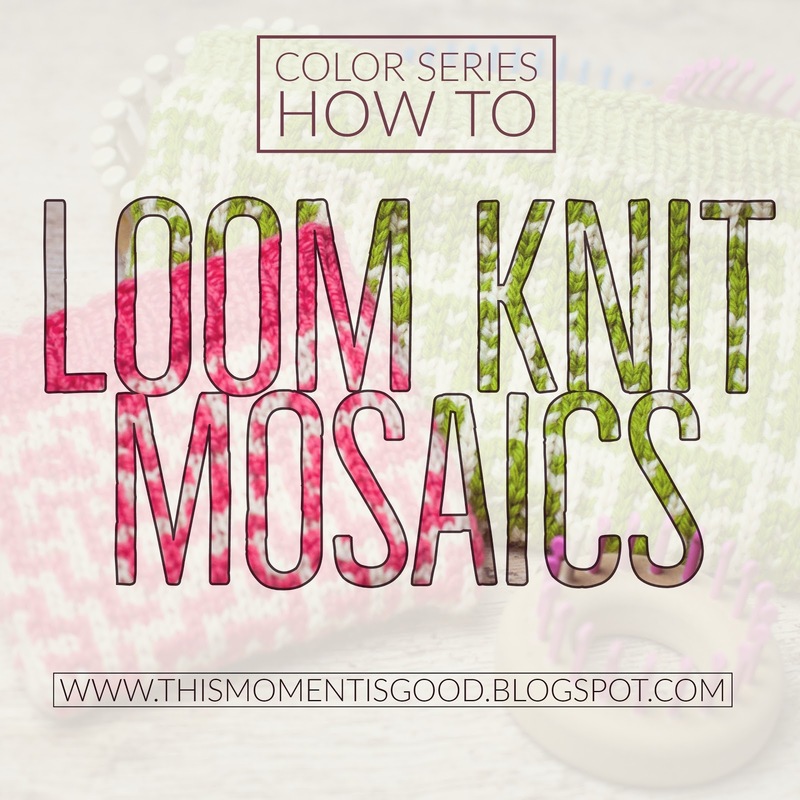 Mosaic Loom Knitting | Loom Knitting by This Moment is Good! Hello loom knitters and welcome to our color series! This is topic 5, Mosaic & skip/slip stitch colorwork. 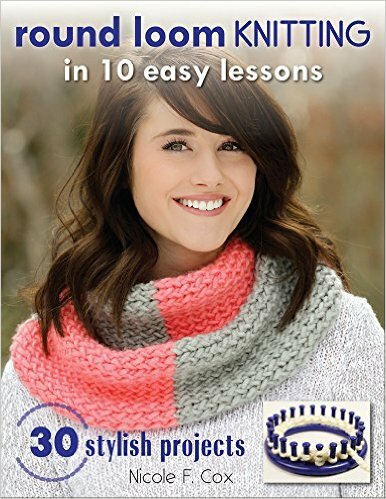 Above loom knitting Patterns Can be found Here! 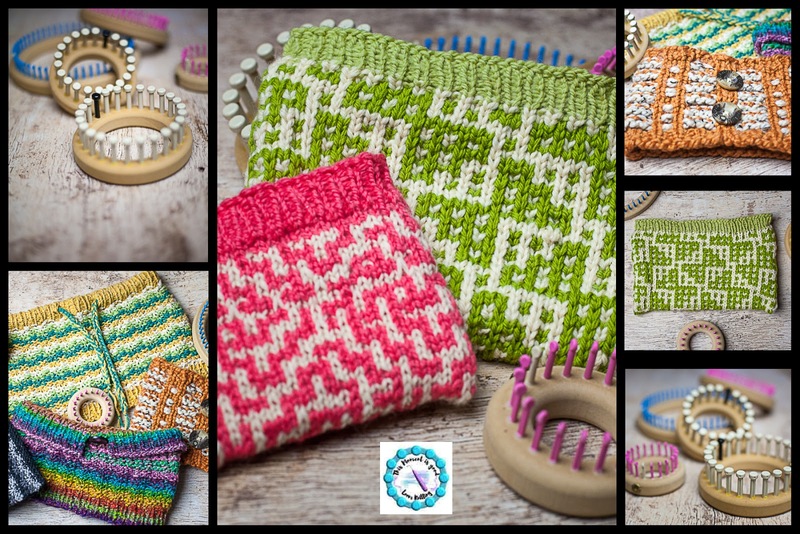 This is the 5th in a series of blog posts and accompanying videos, pictures discussing different methods of using color in your loom knitting. Check back for future articles or subscribe to our mailing list to be the first notified of the new posts in this series. This post is about Fair Isle loom knitting. 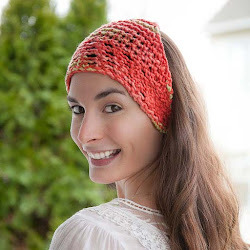 What is Slip/skip Stitch colorwork? Slip/skip stitch colorwork is a technique used to make different color placement effects in knitted fabric. By skipping stitches/pegs, you can create beautiful waves, blocks, mosaics and color effects. How do I do a skip/slip stitch on the loom? 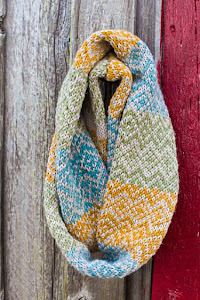 Mosaic colorwork is a pattern created in the knitted fabric using slip/skip-stitch using 2 colors. 2 different strands of yarn are used but only 1 is knit with at a time. Two rows are worked in one color, then 2 rows are worked in the other color and so on. Is Mosaic colorwork hard to do on the loom? No, it is well adapted for the loom as the loom knitter never has to handle more than one color at a time. Beginners can create exciting, complex appearing designs with very little experience. 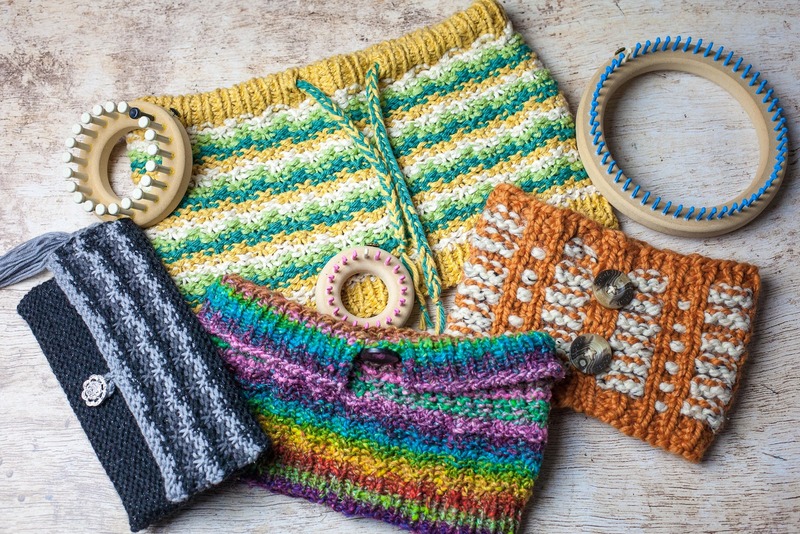 If you know how to read a pattern/chart, do the knit stitch (k) and skip a peg with the yarn in back (skip1 wyib), then you are ready to do mosaics! What are the principles of Mosaic colorwork? Mosaic colorwork is simple enough for a beginner! It's also faster than Fair Isle/Stranded colorwork. Always work with two colors. Although you can add other colors in different sections as was done in this beautiful needle knitting blanket pattern. See the Pattern! Work each color for two rows. You will work 2 identical rows for each color. Example; row 2 will be worked identically to row 1, with the same sts being skipped and the same stitches being worked. The patterning will usually change with the color change. Always skip or slip your stitches with the yarn in back of the peg (wyib). Mosaics may be worked on any number of stitches, although your patterning may be slightly off center. 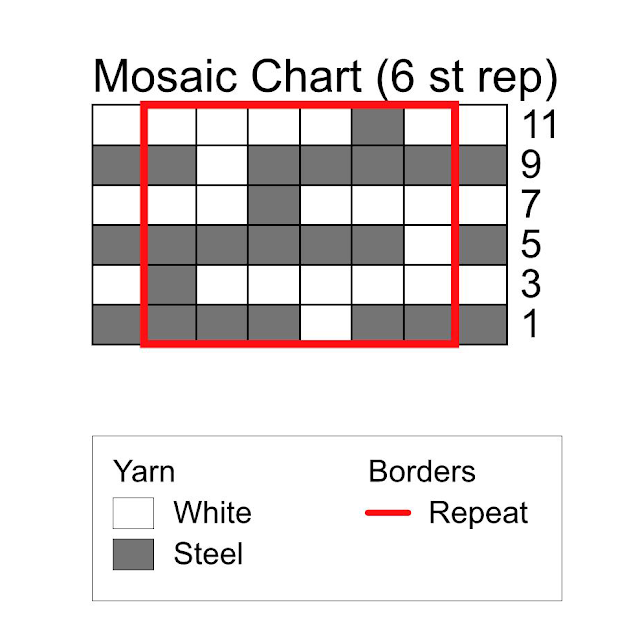 Because 2 rows are identical in mosaic knitting, the charts are usually compressed (but not always, if the designer wishes to help out beginners by showing the entire pattern) to show every other row. Each single horizontal row represents 2 rows of knitting. There is no stranding (locking in floats) in Mosaic colorwork. Using skip/slip sts eliminates this need. Occasionally, you will see a mosaic pattern with longer color gaps of more than 4 sts, in this case your knitting will be neater if you lock in your floats. Are there resources for mosaic charts? Yes, Barbara G. Walker has an entire book dedicated to Mosaic Patterns/charts, it's awesome. See the Book! Here is a cool resource for creating your own Mosaic charts Go to link! There are rules to making your own Mosaic patterns, this makes it easy. 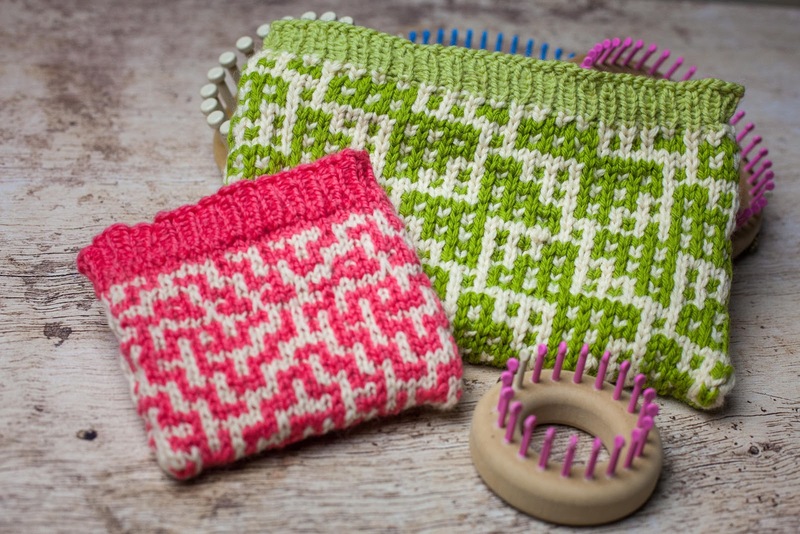 Detailed and interesting article on Mosaic knitting (needle knitting is not much different in colorwork except that we don't have a wrong side to our knitting) Go to Link! How do I read a mosaic chart? Lets walk through a couple rows of a Mosaic chart! All Mosaic charts are worked in the same manner. Chart explanation: Mosaic charts are different then Intarsia or Fair Isle charts. Each row counts as two rows. Row 1 is actually row 1 and 2. Rows 1 and 2 are knit in the steel color. Rows 3 and 4 (the next rows on the chart, written as just row 3) are knit in white only. Note that the chart is worked differently in the round or if flat knitting. The selvage sts are eliminated when knitting in the round. Rows 1 and 2 (right to left, knitting flat): K1, *K2, skip1 wyib, k3, repeat from * to last st, k1 (in color Steel only). Rows 3 and 4 (left to right, knitting flat): K1, *skip1 wyib, k5, repeat from * to last st, k1 (in color white only). Keep working in this manner until end of chart, then repeat, changing colors every 2 rows. Rows 1 and 2 (right to left, knitting in the round): *K2, skip1 wyib, k3, repeat from * to end of row (in color Steel). Rows 3 and 4 (right to left, knitting in the round): *K5, skip1 wyib, repeat from * to end of row (in color white). That's it! Mosaic and Skip/slip stitch knitting is fun and easy and gives a dramatic result. Please leave any questions you may have on this topic in the comments below and I will update the post as needed to add helpful information. 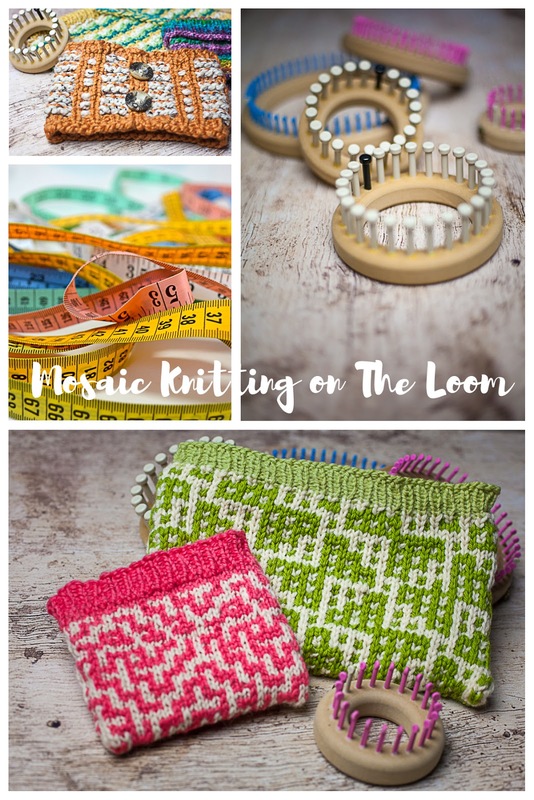 Can you make a video of how to mosaic loom knit? Anonymous and Jessica, I do not have a video at this time but maybe sometime in the future. I'm not a very video oriented designer as they are very time-consuming. This is step by step on how to read a chart, maybe just take a little more time to go over the post and the included instructions or buy a pattern that has mosaic colorwork in it. Sometimes actually working through a pattern can help you understand a concept. Jessica, have you tried actually working the chart in this post before trying anything else. It gives you written directions and the chart. Sometimes reading a post is not the same as working through it on the loom. I did your sample in the round (24 peg) for a mini hat. It looks great! The only thing is I used the U Wrap and notice some uneven stitches where I skipped. 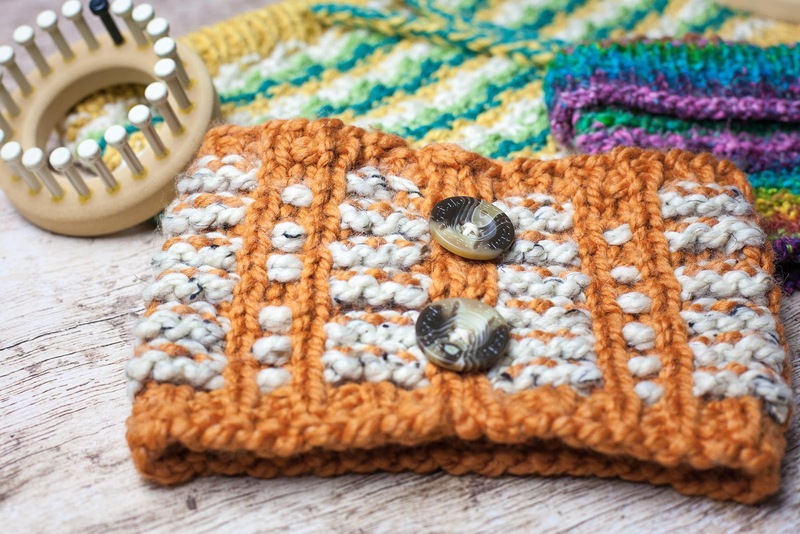 Is it better to use the True Knit Stitch? Hello Anonymous, I always use the regular knit stitch in colorwork (opposite of the purl stitch) as it produces the best-looking fabric. I know some people have had success using the u-knit but I never think it looks as nice as the regular knit stitch. This is because the tension is tighter with the u-knit creating smaller stitches that do not stand out as well. Those stitches are also interlocking in a different manner. Uneven stitches can also be a tension problem with the loom knitter and that should resolve with practice. Oh, I don't use the term "true" knit stitch as I think it makes it sound as if the u-knit and flat knit are not creating "stockinette" stitch. I prefer to call it the "regular knit stitch" as all 3 stitches produce stockinette. It also harkens back to the myth that anything a needle knitter does is "true knitting" as opposed to what loom knitters do as something lesser perhaps. It's just a preference of mine, I just didn't want you to become confused because I didn't use the same terminology. Thank you for your quick reply. I will try my next sample with the regular knit stitch. I picked up the habit of calling it the "true" knit stitch when first learning the various ways. You're welcome! Many people refer to it as that, no worries there as there is no right or wrong on stitch names just preferences.